Pilgrim Sailing offers small personalised lunchtime and twilight sailing cruises around Magnetic Island on a beautiful 58 foot yacht. Pilgrim is also available for private charter for the day - perfect for families or groups of friends to get together and explore the island. Activities on charters can include sailing, snorkelling, exploring on the beach, whale-watching (in season). Pilgrim Sailing has been in business since 2010 in Sydney and since 2015 has expanded into Queensland for the winter seasons (April to October). The business is owned and operated by a down to earth couple - Paul and Clare. Pilgrim, the yacht, is one of a kind, custom built to the highest standards. She is loved by sailors and non sailors alike. Jump on board for an intimate sail to one of the Magnetic Island bays for a swim and a barbecue/seafood lunch. The 58-foot yacht, Pilgrim, is perfect for all ages. She is large, stable and comfortable with plenty of beanbags to relax on. Above all, Pilgrim is a beautiful, stylish and classic yacht which will make you feel special the moment you step on board. The tour includes a sail to one of the secluded bays on Magnetic Island, where there's an opportunity to explore the beach, go for a swim or snorkel (conditions permitting) or just relax on the giant inflatable mat before enjoying a delicious lunch followed by the sail home. Lunch is made with quality ingredients and includes premium sausages and locally caught prawns, homemade salads with fresh bread rolls. Bring your own: wine/beer. Interested in sailing? Paul and Clare, your down-to-earth hosts, are passionate about sailing and love to show you the ropes! There will be no more than 12 guests to ensure a personal service and space to spread out and relax. 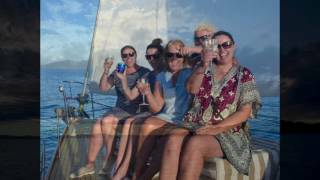 Pilgrim Sailing offers private skippered sailing charters around Magnetic Island on a beautiful 58-foot yacht, Pilgrim, with great hosts, Paul and Clare. Pilgrim, is perfect for all ages. She is large, stable and comfortable with beanbags to relax in and two cockpits, which are super-safe for kids. Above all, Pilgrim is a beautiful, stylish and classic yacht which will make you feel special the moment you step on board. Combine this, with excellent service and hospitality, and you have the makings of a perfect day out! The day is tailored to suit - four-hours of sailing, swimming, and lunch, a full day on the water or a sunset cruise with cheese and wine. Pilgrim's features include a barbecue, shade, beanbags, swim ladder and play-inflatables for the water. Interested in sailing? Paul and Clare are passionate about sailing and love to teach and get you involved. The kids will love it too. You can choose a fully-catered charter, or bring your own. Catering options include local seafood, a delicious barbecue and more. Regardless of who provides the food, your hosts will do all the hard work - preparing, cooking and laying it out. All you need to do is eat it! Join Pilgrim Sailing for an intimate sunset sail on a beautiful 58-foot yacht, Pilgrim, in Cleveland Bay, while enjoying some Australian wines and local cheeses. Pilgrim is a stylish and classic yacht which will make you feel special the moment you step on board. Combine this, with excellent service and hospitality, and you have the makings of a perfect evening. Enjoy a sail in Cleveland Bay and relax as you soak up the magical views of Magnetic Island and appreciate the peace of sailing. Paul and Clare, your down-to-earth hosts, are passionate about sailing and love to share it and even give you a try on the wheel if you want! On board, they serve quality local ingredients from family-run businesses. There's a selection of wines, from Tamburlaine, Australia’s largest certified organic wine grape producer, who strives to produce the best quality wine from premium wine regions. On the cheese platter, they serve local Gallo Cheeses, accompanied by "Pilgrim"-made pumpkin chutney. Available every day (except Tuesdays) April to October.